It is an idyllic setting with rolling hills of variegated green and clear blue streams that bubble and tumble over limestone boulders. It is here, nestled in the Ozark Mountain Region, where a community of farmers are dedicated to raising food organically and sustainably. They are sharing their passion, their produce and their knowledge to build a strong, healthy community in Eureka Springs. These farmers are part of a local small-farm network that supplies the residents and tourists of the Eureka Springs region with “fresh food, inspiration and education”. 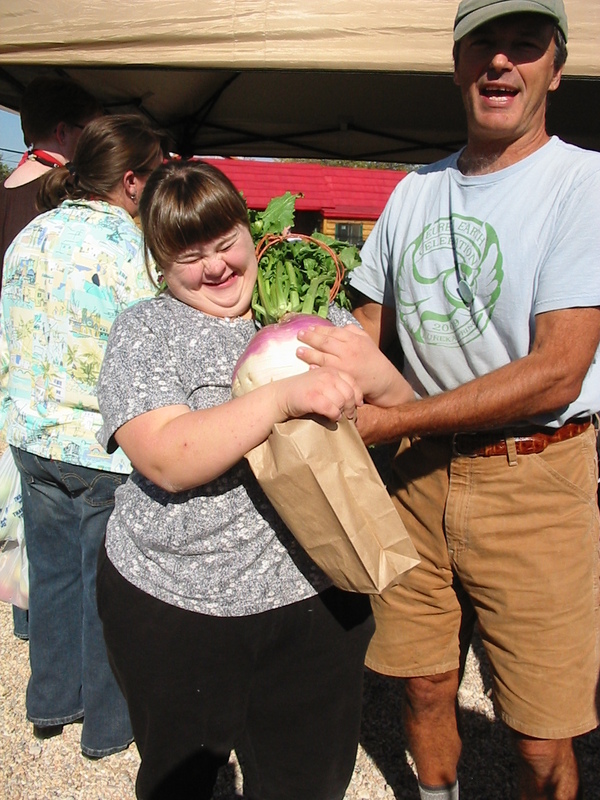 Patrice's large turnip goes home with a very happy turnip eater. farm should “feed its own”. 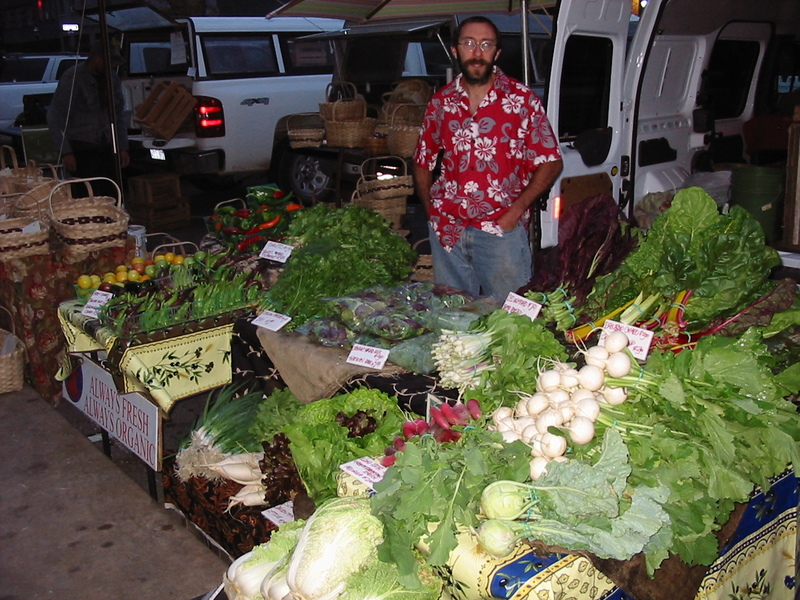 He focuses on providing quality produce at the peak of freshness and quality. By understanding the regions ecology and economy, Patrice minimizes the use of machines and instead, uses permanent “no-till” beds, multi-cropping, and organic mulching. In fact, he openly shares his journal for those who are interested in the techniques and details. You can learn more about Foundation Farm by visiting their website. If you are inspired by the local foods movement, Foundation Farm offers gardening classes and a Farm School for those who are serious about becoming a farmer. Patrice’s story will inspire you to start your own farm so read with caution. Visits to Foundation Farm are welcome and you can even get your hands dirty if you visit on a working day. Karen Gros studied at Lenotre Ecole de Cuisine and Francoise Meunier Cours de Cuisine in Paris, France. home near the farm. Having attended master classes at the Lenotre Ecole de Cuisine and the Francoise Meunier Cours de Cuisine in Paris, she specializes in French-inspired cooking. If you are looking for a real international culinary adventure, consider accompanying Karen to France on an exclusive tour with activities focused on food, tradition, history, culture and people. You will have the opportunity to meet and cook with great chefs and great people while traveling in comfort and beauty. Oak Hill Farm is worked by Andrew Schwerin and Madeleine Keenan along with their dogs Roux and Dagbert. Worked with only their hands (well… the worms help out), Oak Hill Farm’s vegetables are produced with love and care. Follow what is happening at Oak Hill Farm on Facebook. Shady Grove Farm is committed to “sustainable” farming. They don’t just sell their food locally but are committed to buying breeding stock and feed locally as well. Their understanding that the animals they care for are in turn “sustaining” their community, Drew and Katie are committed to interactive farming and care for each and every one of their animals. Shady Grove Farm lovingly produces chickens, turkeys, duck, pork, eggs, goat’s milk, and honey. Follow Shady Grove on Facebook or their blog and see photos of Shady Grove Farm. 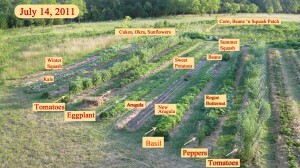 There are so many more great people growing food for the community. Here is an incomplete list of other area growers. I hope to write more about our farming community at a later date. Picture perfect produce at the Fall Farmers Market. 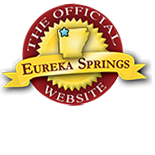 Visit Eureka Springs Farmers Market to take some home. Do you wish you could eat like the locals but you are just visiting? Locally grown produce and locally made products are available at the area farmer’s markets including Eureka Springs, Berryville, and Holiday Island. Find out when the next farmer’s market is on the Calendar of Events. Even if you can’t make it to one of the area markets, many of the restaurants buy produce from Carroll County Fresh. It is just another way that Eureka Springs Restaurants remain Extraordinary. If you happen to be visiting August 10, 2011… consider attending the first Farm to Table culinary event in Eureka Springs. 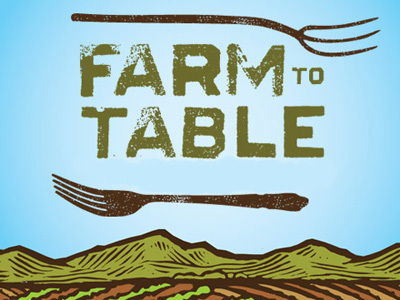 Farm to Table event August 10th. Carroll County Fresh is partnering with the Crescent Hotel and the Crystal Dining Room to bring the first Farm to Table dinner to Carroll County. Read a local newspaper article about the event and reserve your tickets. Proceeds from the event help support the work of Carroll County Fresh and local farmers. Tickets are $40 and can be purchased online at www.carrollcountyfresh.com, and at several local businesses including The Eureka Market, Community First Bank (Eureka Springs and Berryville), and Eureka Springs Farmers’ Market at Pine Mountain Village on Tuesday and Thursday from 7 — noon. Find locally grown products near Eureka Springs and I wish you Happy, Healthy Eating! This entry was posted on August 3, 2011 by estcblog in Crescent Hotel, Culinary Adventures, The Great Outdoors, Things to Do and tagged culinary, farming, food, local culture, organic.